Backed by a diligent team of professionals, we have been able to trade and supply a qualitative range of Shrink Wrapping Machine. Sourced from the trustworthy vendors of the market, this machine is manufactured with the help of qualitative components and ultra-modern technology. 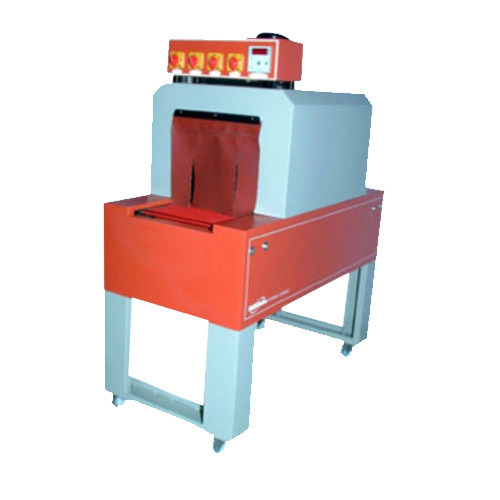 In addition to this, our offered machine is well known for its excellent performance and easy to operate features. To ensure its flawlessness, the provided machine is stringently checked by the quality experts against numerous parameters. Temperature 0-300 C. 0-300 C.
Voltage 3Ø, -440 V. 3Ø, -40 V.
Operated since 2001, we “Excel Packaging”, are leading company that is instrumental in Trading and Supplying highly functional Semi Auto Strapping Machine, Auto Strapping Machine, Continuous Band Sealer, Pneumatic Pet Tool, Shrink Wrapping Machine, Box Wrapping Machine, Palletizing Machine, Vacuum Packing Machine, Pneumatic Nailer, etc. These machines are broadly demanded in various industries like chemical, pharmaceutical and food processing for filling wrapping and packaging purposes, Machines provided by us is sourced from the authentic and trustworthy vendors of the market under the supervision of our experienced procuring agents. Keeping in mind the different choices of the clients, we provide these machines in several specifications within defined time frame. We offer our product under the brand name of Excel.